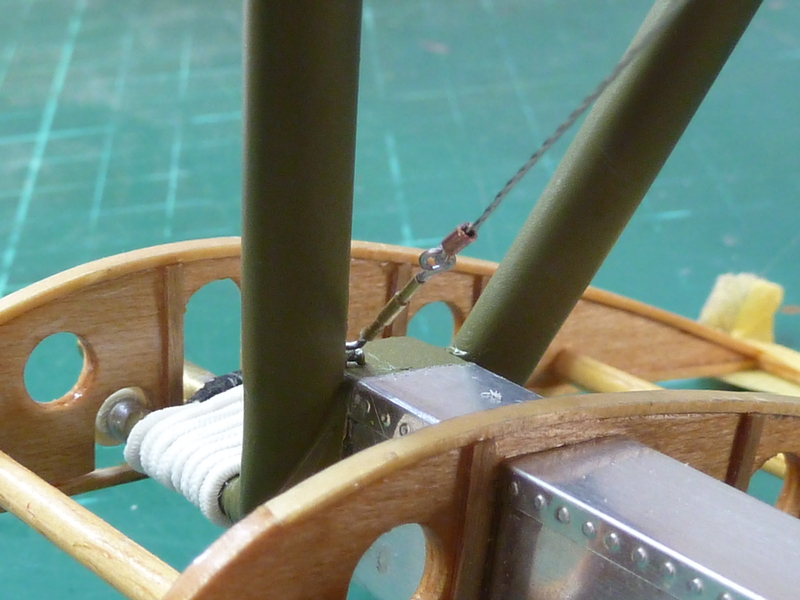 We’re on the final lap now and hopefully the model will soon be completed and hung up in our living room, to complement the Sopwith Camel.The last major job was to cover and paint the top wing. I’d mulled over how to do this for quite a while as the model doesn’t come with the helpful inspection windows that the Camel did. These enabled to control lines to be fished through the covered wing and located properly on the pulleys with the wing fully covered. Ultimately I came to the conclusion that the only way to run the lines in the Fokker was using a similar arrangement. So the decision was made to finish covering the wing off the aircraft, paint it fully on the bottom side and leave the top side requiring the final coat of paint. 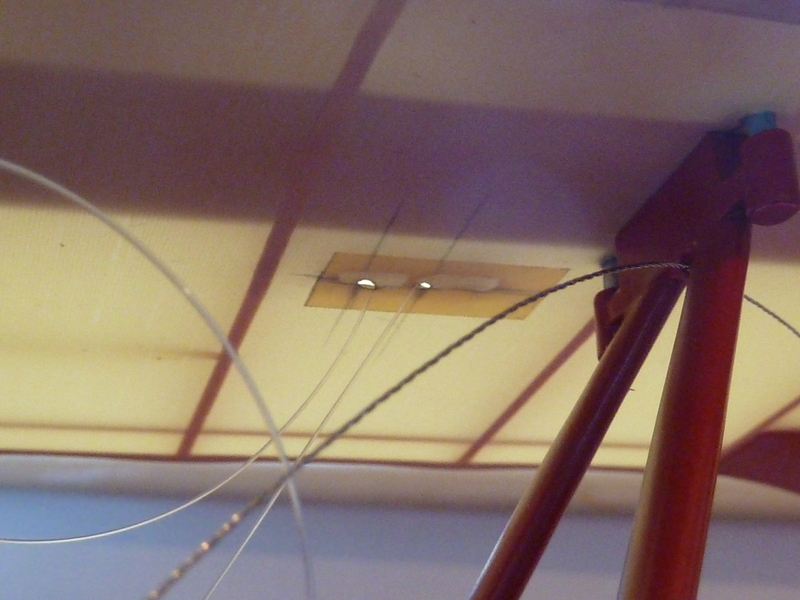 Prior to it being covered, lines were run through the structure which would allow the actual control lines on the aircraft to be pulled through when the wing was installed. Here’s the covered wing being trial installed to work out exactly where the skin exit holes for the control lines were required. In the end , in order to get as small an entry hole as possible a patch was necessary on the underside. Apologies for the quality of the picture, but it is the only one I took of the installation. The clear lines are fishing line which was installed prior to covering to allow the model’s control lines to be pulled through. 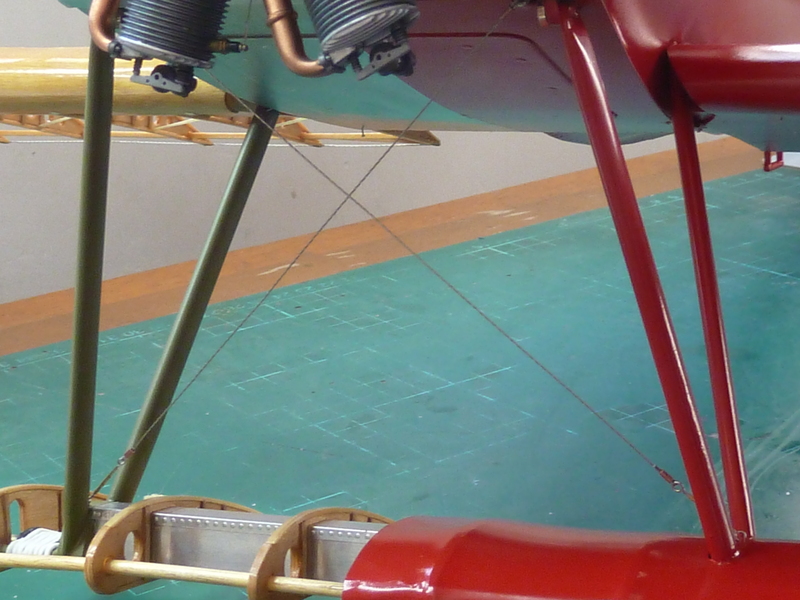 Once the part-painted wing was installed, access holes were cut into the wingskin to allow the control lines to be fished through and correctly installed on the pulleys. 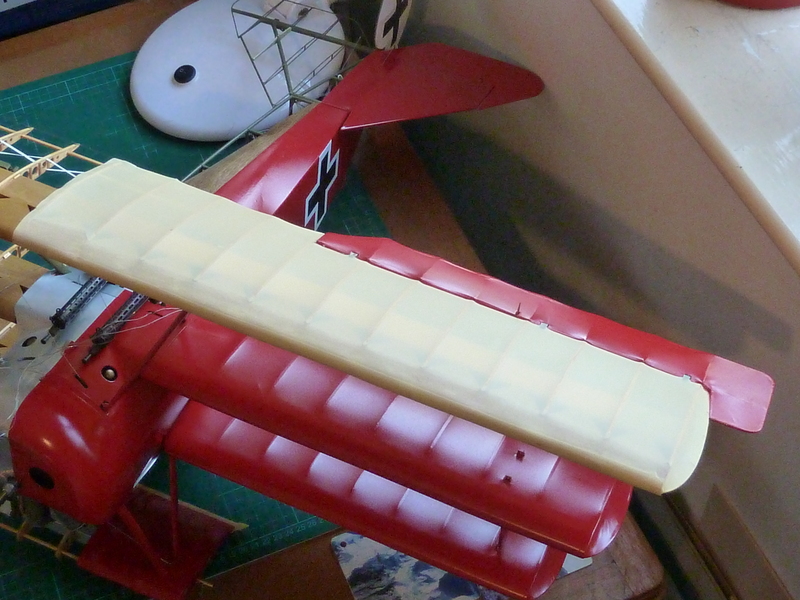 Patches were then put over the holes and the final coat of paint applied to the top wing in-situ. The balken kreuz was painted in the same manner as the one on the fuselage, though this time using a 3:1 ratio for thickness to length, as this is how it was on the real aircraft (a number of directives on the shape of the crosses were issued at this time, progressing from the iron cross to the balken kreuz in various stages and it was not uncommon for aircraft to have mixed standards on them from what I’ve seen). I have to honest and say that I’m not very happy with the quality of the finish on the top wing. The patches haven’t blended in as well as I’d hoped. The one under the cross isn’t bad, but the other leaves a lot to be desired. Likewise for the first, and only time on this model, the underlying paint picked up on the aileron when I was removing the last bit of masking tape having sprayed on the insignia. It left a bad blemish and raw undercoat showing through. I could’ve, and fact did, swear at this development. The very last bit! Oh, and I’d used up virtually all the spray paint at this stage too. I’d only kept back a very small amount for touching up bolt heads and the like. I’ve filled the blemish, sanded and polished it smooth, but the change in texture of the finish is fairly blatant. It’s on the upper side so won’t be seen when the model is hanging up, but I’m still pretty annoyed about it, but I think I might only make things worse if I keep messing with it. Once the wing was in place I finished off a few odd jobs that had been hanging around waiting for this event. Properly installing the engine and cowling was one, including making a manufacturers’ part label for the starboard side, which is missing from the kits decals. I also finally rigged the undercarriage and cabane struts. 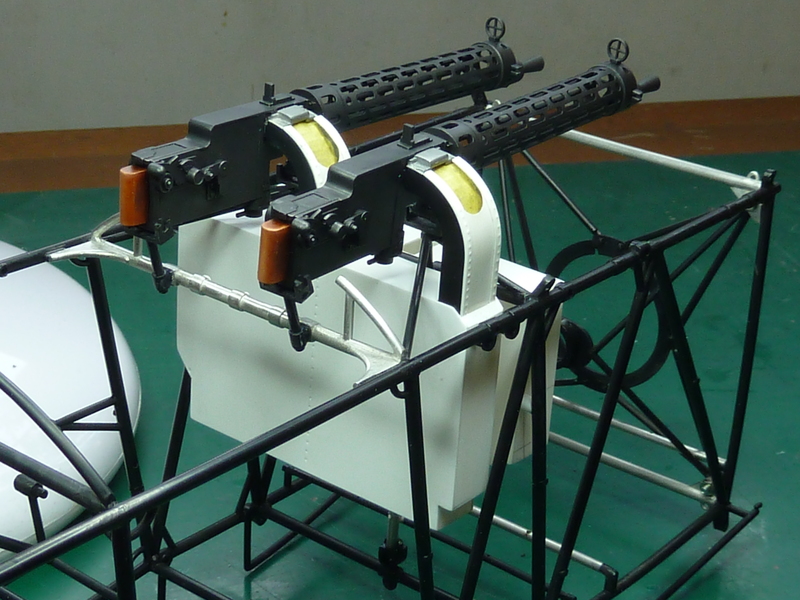 One other final piece to be installed was the crashpad on the back of the guns. I’d made one of these ages ago when I was doing the guns, but it didn’t look too realistic, so I ended up recovering it with modelling putty and sculpting it a bit. Not something I’m very good at. 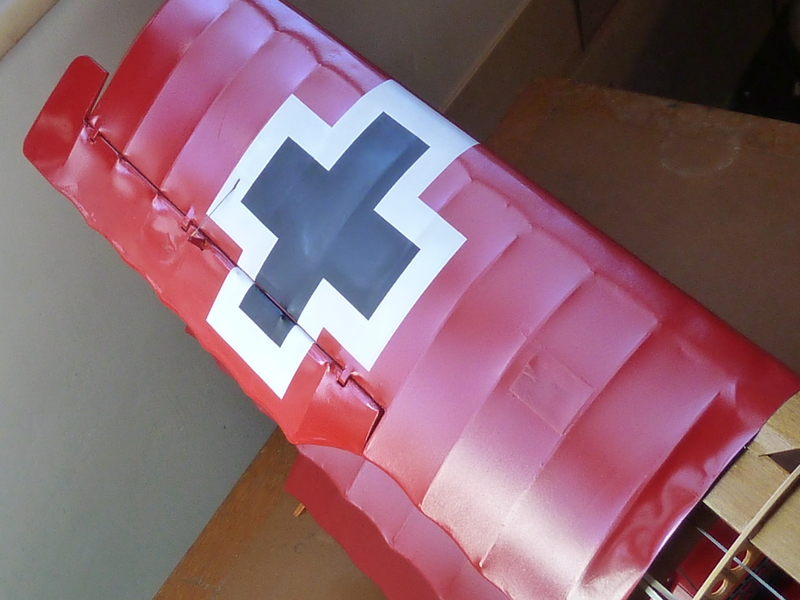 The final result was OK and is much better than the individual pads supplied in the kit. 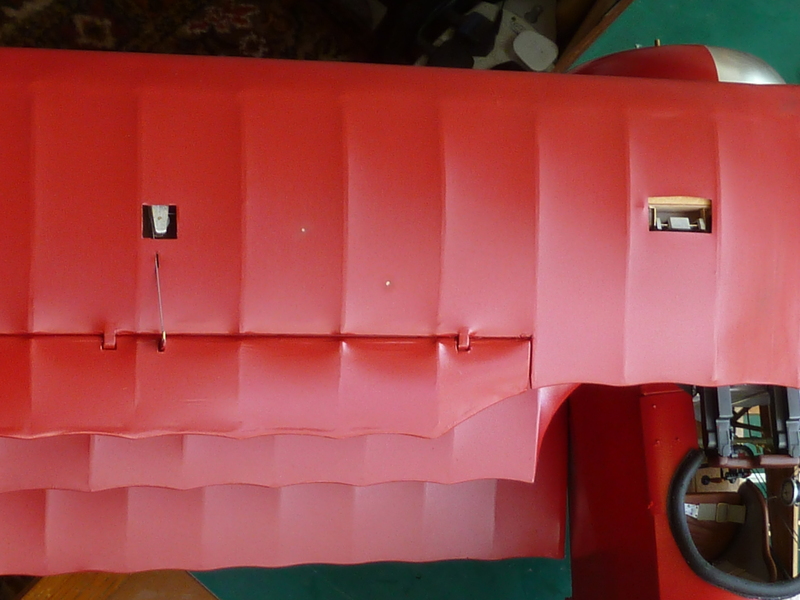 The kit supplied pads can be seen below in one of my early assembly pictures. 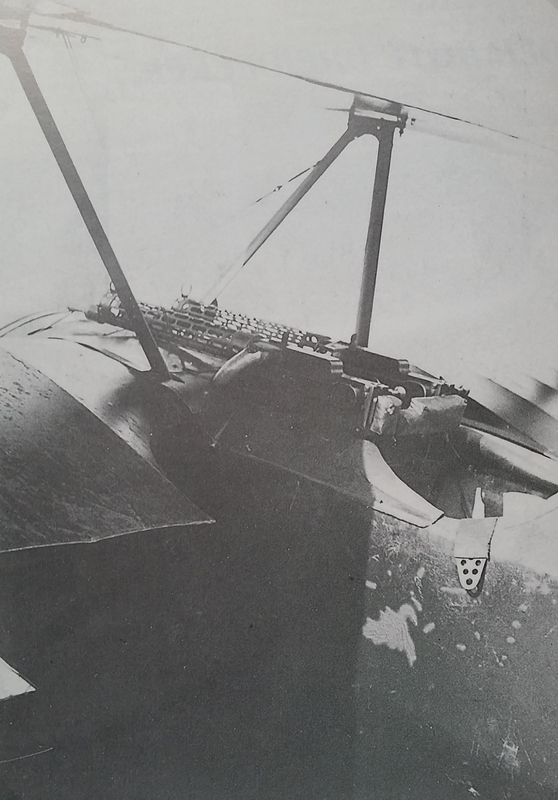 The actual pad on Richthofen’s aircraft is clearly visible in this shot. And this is my interpretation of it. Apart from installing the wheels, which should be a 30 minute job, the only real job left is to paint and install the propeller. 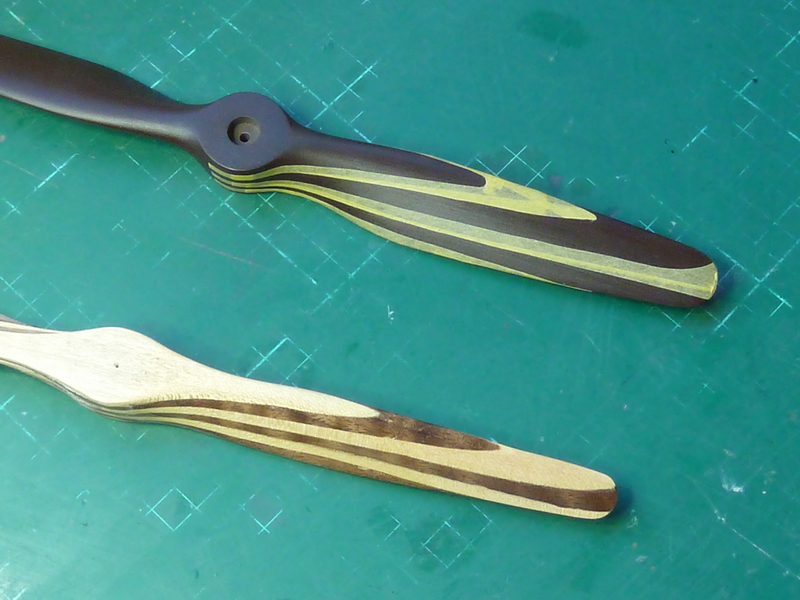 I had started to make my own propeller from laminated maple and American walnut, as I think the kit one is a bit oversize and a natural wood one would look so much better, but sanding the first half of the one I made left me quite ill due to the noise and dust, so I’m back on plan A and trying to add a wood texture finish to the plastic prop supplied in the kit. The two are shown side by side above. I’ve already done the dark wood pattern on the plastic prop and am trying to work out the correct masking pattern for the light sections. Not the easiest thing I’ve ever done though, so we’ll see how good the final result turns out. 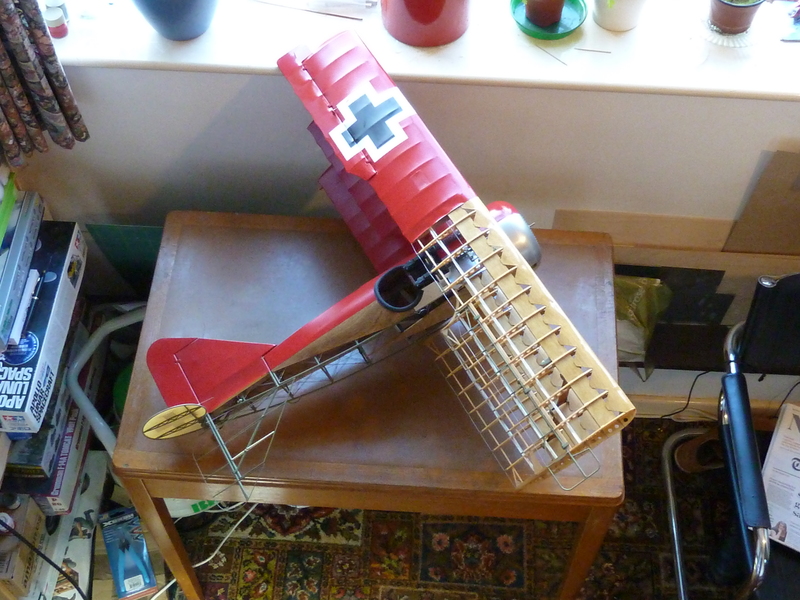 Hopefully the next post on the Fokker will show the final completed model. It’s been a bit of a grind getting here for the last few posts as my enthusiasm for the model has waned a bit. However, those who’ve seen the model assure me that it does look quite impressive now. It’s certainly giving me space problems on the modelling table. To me part of the beauty of these aircraft is very much in their structural design, and the way you display them really shows this off well. I’m an average ‘Joe blogs’ and wouldn’t notice and blemishes, besides, in a war situation I’m sure many had patches and irregularities in their finish too. It’s another stunner! The thing that irritates me is that I’m trying to do an idealised ‘engineering example’, rather than a true to life weathered model. If I was trying to do the latter it would look quite different, not least because of the well known chipping of the paint around the cockpit of Richthofen’s last DR.I, which you can see in the photograph above showing the crashpad. The engines also ran a total loss castor oil lubrication system. 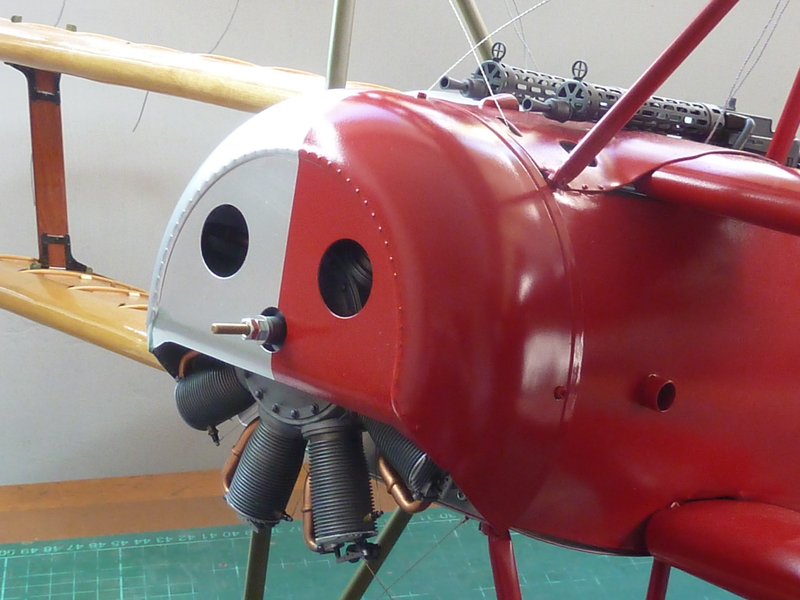 One of the primary reasons for having an engine cowling was to catch the unburnt oil flung out the exhaust ports and direct it away from the pilot (digestive problems due to ingesting too much castor oil were not unknown in WWI pilots). So throughout the flight oil was draining out the bottom and streaming back along the fuselage underside. 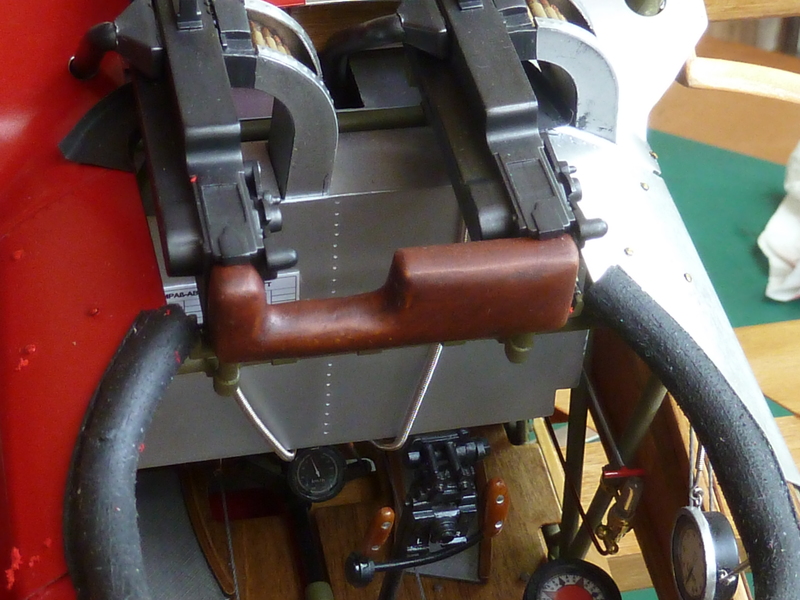 Some pictures of Sopwith Camels show the underside of the fuselage to be almost black because of this.